Nintendo has announced they will be ending their YouTube-focused Creators Program by the end of December 2018. Video makers will now be able to freely stream and produce videos around Nintendo games and retain full revenue from their work. As of now, no new applications will be accepted, nor review ones that have been submitted already. The website itself will be shut down in March 2019. 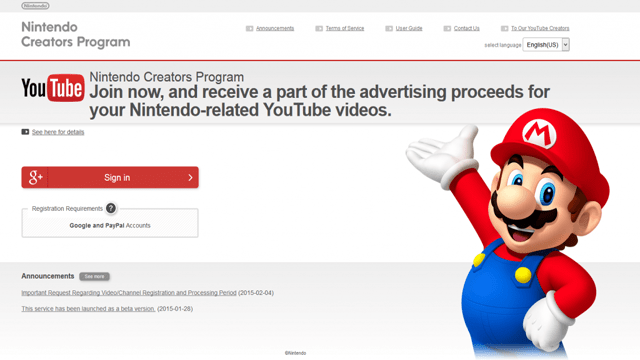 In exchange for the end of Nintendo Creators Program, the company set some new, simple rules, including restricting content to officially-released software, gameplay that includes some kind of commentary or original content, and no implication of Nintendo or YouTube sponsorship. Having been around since February 2015, the Creators Program allowed YouTube creators to play, stream, and create videos built around Nintendo software, albeit with severe limitations. Users who were approved for the program could invoke Nintendo’s games with the company claiming a portion of the video’s revenue, enforcing a white list of approved Nintendo-published titles, and even banning YouTube streaming as of last year. The Nintendo Creators Program was widely criticized at the time of its inception, with YouTube giant PewDiePie calling it a “slap in the face.” With its termination four years later, YouTube creators can once again freely make and monetize their own Nintendo videos with less repercussion.